Jason Friend & David Heinemeier Hansson are founders of 37signals – home of products such as base camp, high rise and creators of the “Ruby on rails” revolution. The 37signal’s team created software products that are used by millions of people, by doing stuff different. They provide simple tools for people like them, with basic problems. They have not designed a product with more feature s than their competitors. They focus on delivering fewer features, in a simpler and easier product to use. 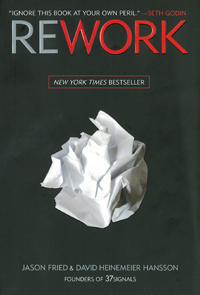 I have just finished reading their book “Rework”. I must say it’s is the most refreshing look at how to grow a business, that I have come across for some time. It has gone on my top 5 books business owners must read. Every page is a gem. What makes this book interesting is they challenge the norm e.g. you don’t need to employ heaps of people to grow a successful business. Their company is small, Frugal and profitable”, services millions of users worldwide and employees only 16 people. Workaholism is stupid – working more doesn’t mean you get more done, it just means you work more. Underdo your competition – focus on less than your competitors but better than them. Start a business, not a startup: Let’s drop the word entrepreneur and startup it has become synonymous with: creating businesses that spend other people’s money that don’t focus on making real revenue with real profits. Less is a good thing: it forces you to be smart with money. Only employ people who do stuff – no managers. 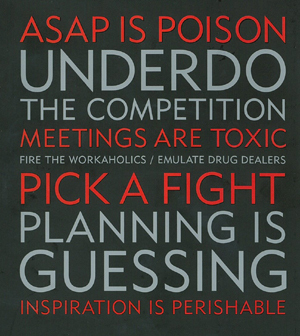 – Hire when it hurts – resist the urge to over hire – teams are more productive when small. Build half a product, not a half assed product: focus on the basics and get them right, and get it out there. Hell they launched a product with no billing system; they figured they had until the end of the month to create the billing system. Make lots of small decisions: the consequences of failure are less and you build momentum. Swap: let’s think about with, let’s decide- don’t waste time on long planning sessions – just do it. Nobody likes plastic flowers – imperfection is natural, seize it and don’t over fuss stuff. Make a stand for something and be brave enough to defend it. Inspiration is perishable – it has a use by date. So when inspiration strikes, do not hold back. – that’s the time to do the all-nighter. Not when you are late on something. Get your own copy of this book, it’s truly inspirational. This entry was posted in book review, Startup 101 - Building Great Companies and tagged book review, Great companies, inspiration, startup by Mark Robotham. Bookmark the permalink. Read this post, bought the book, and read it – fantastic insights with no waffle! Great review…. might have to go buy it or happy to share/swap from my library.